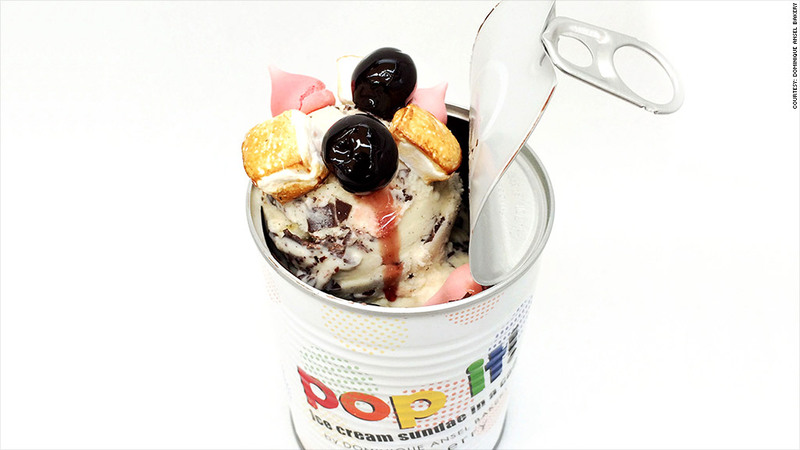 The chef behind the infamous Cronut, Dominique Ansel, announced his newest concoction: an ice cream sundae ... in a can. The "Pop It" dessert was devised in collaboration with designer Lisa Perry to celebrate art and pop culture. "For someone less gourmet, it tastes like a souped-up root beer float," said a spokeswoman for Dominique Ansel Bakery. But for those with more refined palettes, there's quite a bit of culinary genius that went into these sundaes. There's root beer and stracciatella ice cream, mascarpone semifreddo and macerated cherries, a meringue kiss and marshmallows (to help keep the ice cream from turning into a frozen block). The cans are lined with chocolate and sealed in a pop-top lid, channeling Andy Warhol's classic soup cans. Ansel is all about creativity and inventions (he changes up his menu every six to eight weeks) -- but don't expect to see this dessert on his New York City bakery's revolving menu. The sundaes will be sold for one day only on Saturday, August 2 -- in the Hamptons, N.Y. And only 500 will be available for purchase. Other inventions of Ansel's -- like the Cronuts ($5), Frozen S'mores ($7) and Cookie Shots ($3) -- have been major moneymakers. The bakery consistently attracts 100 to 200 people as early as 6 a.m. every morning, waiting to taste his treats. But with the "Pop It" sundaes, Ansel isn't hoping for another moneymaker. In fact, according to the spokeswoman, they don't expect any profit to be generated. 20% of the proceeds from the $15 sundae will be donated to City Harvest, a New York food rescue organization. Ansel has long tried to use his culinary expertise for good causes, according to his spokeswomen. In February, Barney's New York hosted a one day only Cronut pop-up shop; proceeds benefited the Heart of Los Angeles, a nonprofit that helps under-served youth. So, will someone else steal Ansel's canned sundae idea to turn a profit? "I don't think he'd be surprised either way," said the spokeswoman.